This evening's post is a bit of an experiment, as I am trying to make my first blog post from my iPad. Please forgive any formatting glitches as I work to try to get the kinks out of this process! Tonight we return not only to Bowen Designs, but to another Mike Cusanelli sculpt. This time we’re back into mini-bust territory: the Bowen Designs Enchantress Mini-Bust , to be exact. This is a very welcome addition to the Bowen line, and while it has a couple of areas that could be improved, I am very happy with the overall quality of the piece. I first came across the Enchantress in the original Secret Wars back in my teenage comic reading days, and didn’t come to understand her role in Thor’s world until much later. This is a significant Marvel character and she is certainly worthy of inclusion in the Bowen collection. Bowen has been doing a good job of filling out the Asgardian ranks lately so there is a nice group of characters for her to be displayed with. This is a lovely sculpt with a pleasing amount of detail. Enchantress' outfit is a relatively simple one, but Cusanelli has added some nice touches like the ridges on the armor on her arms and the detail on her bracelets. Her hair is beautifully sculpted - something Cusanelli always excels at. The base on this bust also has a great amount of detail, both on the Nordic looking designs and the small details between the bust and the base. I continue to have some issues with Cusanelli’s composition. His poses and gestures often lack power and energy, and unfortunately we see this again here. Enchantress is meant to appear as though she is casting a spell, but the limp pose of her outstretched hand makes her look more like she is flicking a light switch. Am I being too hard on this guy? I really don't set out to find fault - it's something that has struck me about some of his pieces before I've even checked to see who the sculptor is. He does beautiful work, and I particularly love his Tigra full size statue which does have a sense of power, just to prove I haven't bagged this aspect of all of his pieces! It's a small niggle, but something I do think he could work on - aren't armchair critics the best! Some of the latest Bowen busts have had some paint issues, particularly with wandering eyes. Enchantress' eyes are just on the edge of suffering from this condition, but it only becomes apparent on very close inspection and doesn't distract the eye on normal observation. Other than this slight issue, the paint job on this bust is spotless. The combination of greens chosen for her outfit are very comic accurate and great to look at. The different sheens used also add a sense of depth to the piece. The metallic forest green of her bodice and headpiece is particularly beautiful to look at. 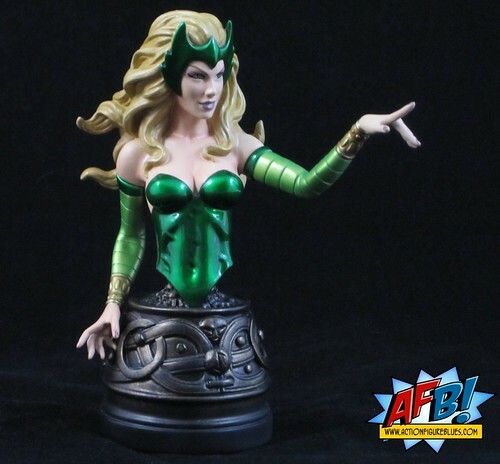 Up next in the Bowen bust review queue is the Web Exclusive Hela Bust, also sculpted by Cusanelli. I'm very much looking forward to unboxing and appreciating another great addition to the Bowen Asgard Display! She'd certainly make a great FS one day as her costume has that great detailing on the legs. Nice one Andy! Yeah! Such a great detailing on the figures. I collect sorts of these stuff, it will be a beautiful collection when i have these. You had a great collection. I also collect somewhat like these before and I'm sort of addicted to it.